I kept coming across Dracula III: Legacy for a while now. So, I figured why don't I check it out. I mean how bad can it be? It must be better than cringing at the cheesy Gila Monster and whatnot, right? In the end, it turned out that the movie was alright. Enjoyable and something to recommend for a 'I am at home with measles, what should I watch' day. Here goes. This week I picked out Lady Frankenstein, an Italian horror flick from 1971. When I checked it out, I didn't realize that this movie is considered a cult classic. Sure, it is classier than most undead movies of that era but at the same time, there was quite a few 'ergh' moments which cuts down its chances of making it to a top ten list. I just know I will upset a number of diehard fans with this review. On with it, then. 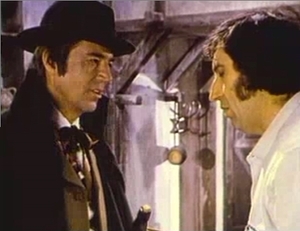 This week I'll talk about a classic British comedy-horror called Bloodbath at the House of Death. Incidentally, a friend had been recommending this flick for a long time and when we did get around to watching it on Halloween, I could see what the fuss is all about. Get ready for some funny-cheesy horror! This gem of a movie was what we watched during Halloween. To say that it was silly would be an understatement. On the plus side, at least it was entertaining in a “It's so bad, it's so bad, ahahahahaha!” sort of way. So brace yourself for a review of The Giant Gila Monster. Academically dissecting work from the lower sub-strata of film doesn’t make a whole buncha sense. But some folks are innately drawn to discursive explanations of films that might not warrant such examinations. 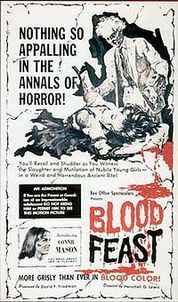 Blood Feast may or may not be a land mark in low budget, kitschy horror films, but it’s (almost) able to entertain viewers over its scant hour running time.